Do you want to grow vegetables and herbs indoors? Unless you are growing a few plants such as herbs on a sunny windowsill, you will definitely need lighting. If you do not use grow lights your plants will become leggy and spindly. They will not develop a healthy root system and let’s face it, they will probably never produce into the food you are looking for. Trying to grow tomatoes in a greenhouse in the short winter days? You will need supplemental lighting. There are a lot of different lighting options available. Let’s take a look at them now. There are basically 3 types of lamps available. They would be HID (high intensity discharge), LED’s (light emitting diodes) and fluorescent fixtures. There are a couple of sub categories in each of these categories. HID lamps are twice as efficient as fluorescent bulbs. They are available in several different sizes from 250 W to 1000W. If these are used as a primary light source a 250 W fixture will cover an area of 3′ x 3′. A 400 W covers 4′ x 4′, a 600 W covers 6′ x 6′ and a 1000W covers a 7′ x 7′ area. You should place your fixtures as close to your plant as possible without getting it too close. The HID lights put out a lot of heat. The best way is to put your hand under the light at the desired height. If it is not too hot for the back of your hand it will be OK for your plant. HID lights come with metal halide (MH) or high pressure sodium (HPS) bulbs. The metal halide is for the vegetative or growth stage. It supplies a blue range of light that is similar to what we have in Spring. The high pressure sodium is for the fruiting or flowering stage. It supplies light in the red range. These systems come with a ballast. It used to be that we had to have one ballast for each type of bulb. But now there are switchable ballasts available that will work with either type of lamp. Historically fluorescent lights were thought of as to be used with seedlings or plants that did not require as much light. But, that has changed with the development of HO (high output) T5 lamps. These are only about 5/8″ in diameter. These high output lights will give twice as much light as the standard T5. They are able to produce enough light for larger or fruiting plants. Of course they will be more expensive than the standard fluorescent lamps. They are available in 2700K(yellow, red light) for flowering or 6500K (full spectrum light) for plant growth. Fluorescent bulbs are also available in T 12, T8, T5 and compact fluorescent models. They are not as efficient and may be best left for seedlings and low light plants. Fluorescent lamps have several benefits. They are lightweight, affordable and easy to assemble. They do not put out much heat at all. These lights should be placed within 4″ to 6″ of the top of the plant. LED lights have historically been very expensive and pretty much out of the range of the non commercial grower. But the prices have come down considerably in the last couple of years. The price on LED lights is still typically higher than the other types, but they will definitely cut down on the electric bill. They use half the electricity of HID and fluorescent lighting and will last up to 5 times as long. Most of these lights have a small built in fan which means they will run cooler. There are full spectrum lights available where you can switch the growing mode. This is much the same concept as the switchable ballasts for the HID lighting. You should check the manufacturers specifications for coverage area and height to hang these fixtures. They are typically hung 18″ to 24″ over the plant. I know everyone hates this statement, but it is something you will need to experiment with. It depends on if you have any other light source and what type of plant you are growing. If you are using it as a primary light source growing inside I would recommend starting at 14 – 18 hours for the growth stage. Once you are fruiting or flowering you can cut this down to 12 hours. If you are using the lights for supplemental lighting in a greenhouse you will not need them on during sunlight hours. The way we always did this was to have our lights come on 2 hours before sunrise and then turn them off. At night we would turn them on at dusk and leave them on for 2 hours. Of course this is all easiest to do with an automatic timer. 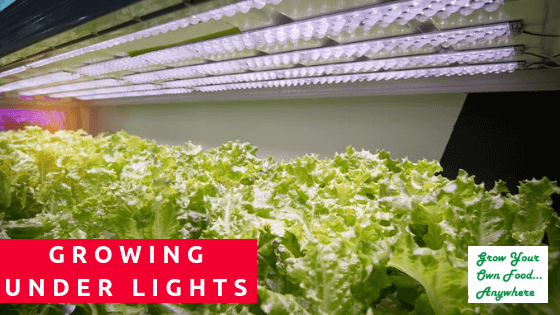 What can I grow using grow lights? With the proper setup you can grow just about any crop under grow lights. One thing to take into consideration is what kind of space will you need. It is probably not practical for most of us to try and grow crops like corn or watermelon inside. A few examples that do well include tomatoes, lettuces, spinach, herbs, peas (will need to be trellised), bush green beans, bush cucumbers, broccoli, cauliflower, beets, carrots, radishes, etc. Keep in mind that you must meet the same temperature requirements that these plants need outside. For example, you cannot grow cauliflower and broccoli in an 80 degree room. You cannot grow tomatoes in an unheated basement in the winter. Just because you don’t have a yard and it is the cold of winter does not mean that you cannot have fresh herbs and vegetables for dinner tonight. Set aside a little space and try growing some food indoors under lights.